I find it fascinating that so many cultures around the world have recipes for fermented cabbage. Europe has sauerkraut, Korea has kimchi, and El Salvador has curtido! When something is done all around the world, with each culture putting it’s own spin on things, you know they are on to something. Many types of vegetables (and fruits, and herbs…) can be fermented, but cabbage is a top contender as it is naturally very high in lactobacilli and beneficial enzymes. 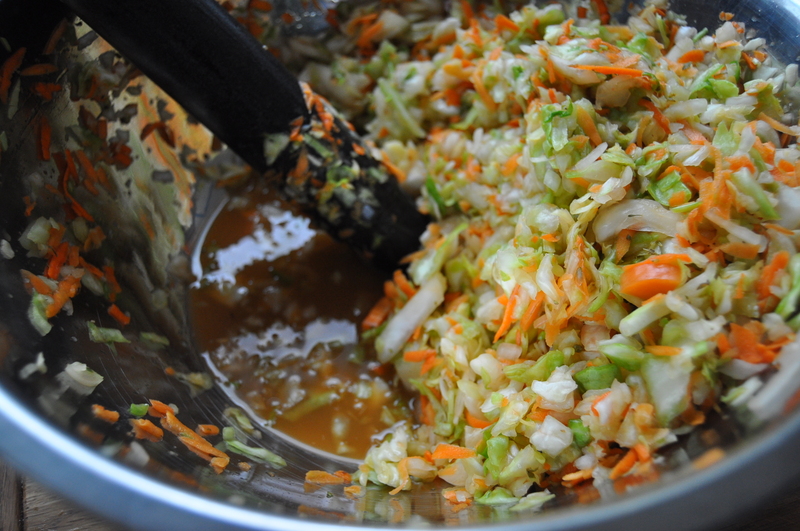 Once fermented, cabbage is rich in probiotics and enzymes and holds powerful health benefits. 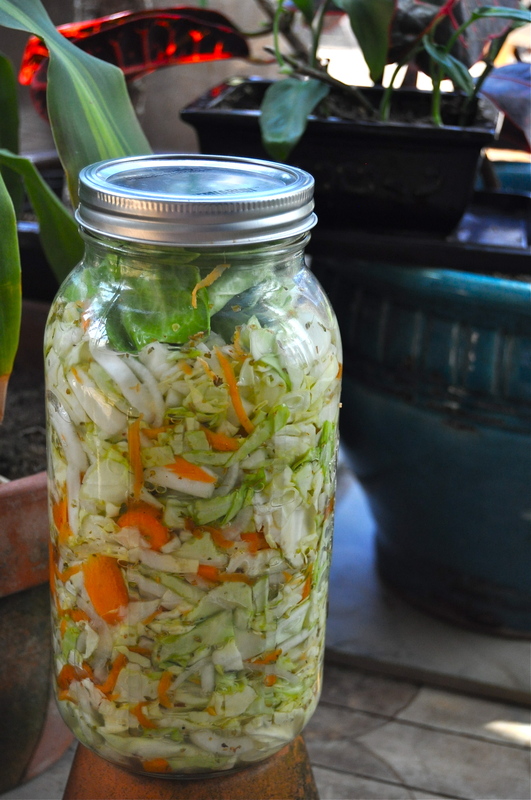 A recent study showed that 2 oz of homemade sauerkraut contains as many probiotics as 100 probiotic capsules. Get it in you! Probiotics have been linked to improved health in almost area. They improve digestion, help control sugar cravings, improve resistance to allergies, improve vitamin synthesis (specifically manufacturing B-vitamins), improve liver function, increase energy, improve the absorption of nutrients, clear your skin, and more! There is an extensive body of research on the mind-gut connection and scientists have dubbed the gut your “second brain” (ever been told to follow your gut feeling? 😉 ) Probiotics support this second brain and help it perform optimally. I plan to share many more probiotic rich recipes in the future to make it easy for you to make these a daily part of your diet. Check out a previous recipe here. In this post I provide you with 2 recipes. The 1st is a recipe that has been passed down from grandmother, to mother, to son. It is a pickled recipe and the flavor is more suited to beginners. It takes less time to make and can be eaten in 2 days. 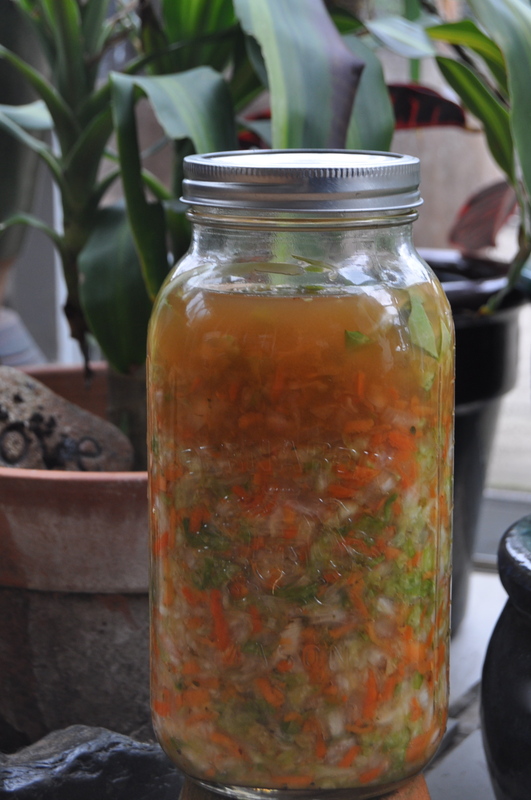 The second recipe is a true ferment and although it takes longer to cure, it is bursting with the health benefits listed above. I encourage you to try and enjoy both. Same ingredients as above (minus the ACV and water). Weigh your bowl before you add the vegetables. Once you have all your ingredients in the bowl weigh it again and calculate the weight of the vegetables. Add 3 T of salt per 5 lbs of vegetables (ex. if vegetables weigh 2.5 lbs use 1.5 T salt…etc.). If you don’t have a kitchen scale, use about 2 T salt for this amount of veggies. Use your heavy object (I like my rolling pin) to smash the vegetables. Get into it because this may take awhile 😉 After a few minutes of smashing your cabbage will begin to release it’s juices. You will be surprised as to how much comes out! For this recipe, that liquid is the brine. Keep beating the hell out of the cabbage. When the cabbage looks like the above picture, pack it into jars. Use something heavy to pack it tightly. Leave 2 inches at the top of the jar. Pour brine (cabbage juice) from the bowl to cover the cabbage. 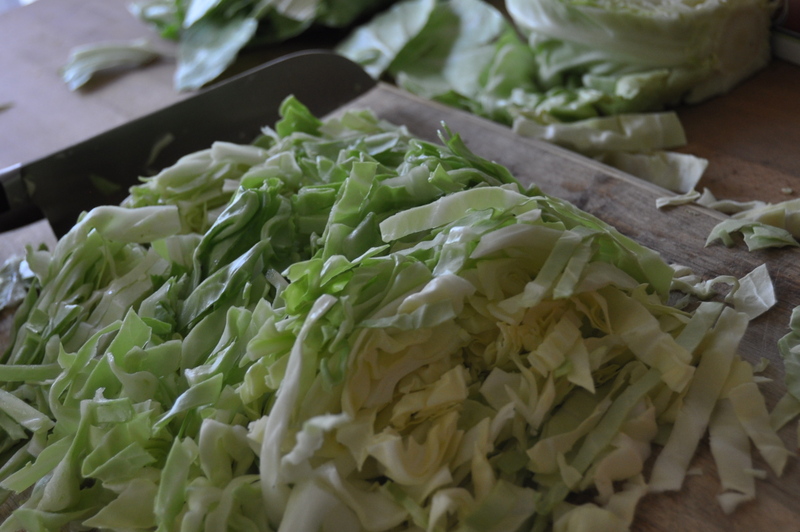 Roll up the reserved cabbage leaves and use them to pack into the top of the jar, submerging all the cabbage under the brine. This recipe needs to sit for at least 2 weeks. The probiotics increase over time so be patient :). Enjoy your curtido as you would a relish or a salsa. I eat mine with tortilla chips, on homemade pupusas (recipe coming soon), with potatoes, or alongside any meal to aid in digestion. It’s very versatile, start experimenting! In El Salvador the jar is always sitting in the middle of the table, ready for handfuls to be eaten with any meal. This entry was posted in raw, salad, snack, vegan, vegetarian and tagged cabbage, cortido, curtido, El Salvador, fermented, latin american food, probiotic, raw, recipe, sauerkraut, vegan. Bookmark the permalink. This looks so yummy! I just recently started making my own sauerkraut. Can’t wait to try this!